This isn’t exactly a buzzy moment, but I thought I’d post a photo of my current camera gear (along with my most recent customizations :) What you see here is a Canon EOS 40D with an MP-E 65mm macro zoom lens and an MT-24EX flash controller for the two macro flash heads on the ring at the front. The flash heads can each move up or down, from side to side, and around the ring itself. 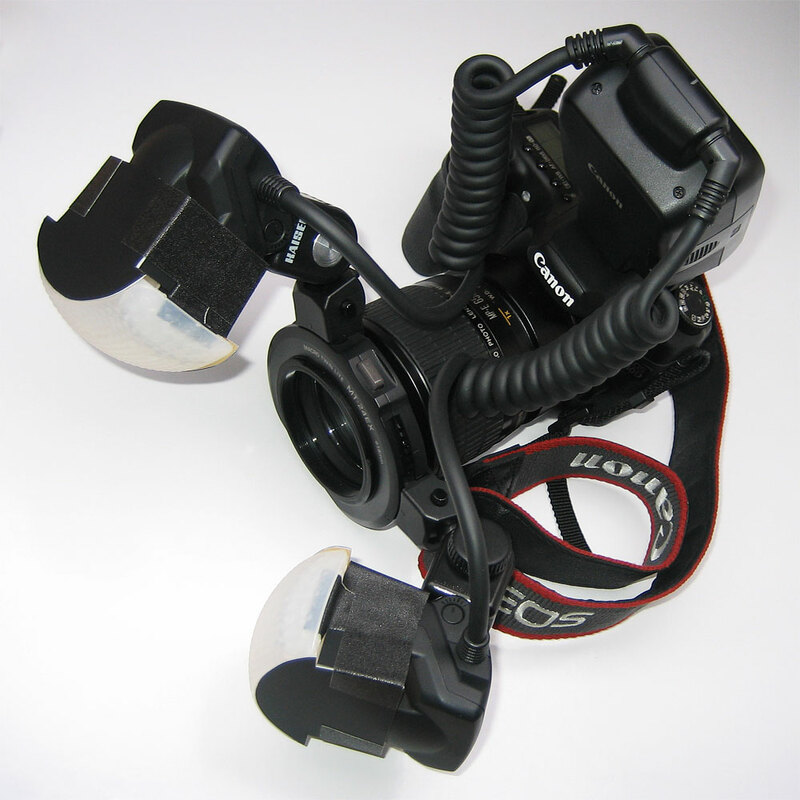 I’ve built custom diffusers that I’ve attached directly to the flash heads with gaffers tape. I used a shiny white cardboard to build a minimal frame around each flash head. I then curved some diffusion material over the front of this frame, acting as a first-stage diffuser. I then mounted my set of Gary Fong’s Puffers to the front of each frame. To finish each off, I used gold matte reflective flash bounce material to seal off the top and bottom. Update: I’ve tweaked this setup quite a bit since I wrote this article! Take a look at my most recent modifications.